This weekend-long adventure will begin by hiking from Kalu Yala’s valley location to the Chagres National Park along remote trails. Upon arrival to the park, we will spend the night camping near a small campesino hut. 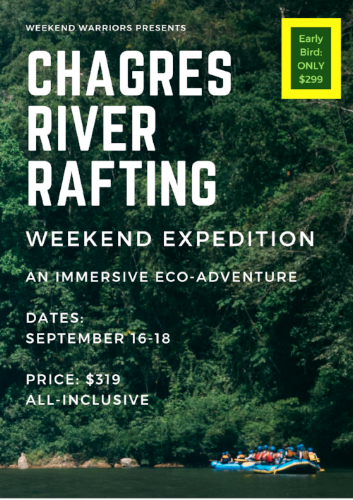 The following day we will begin hiking deep into the park alongside scenic jungle tributaries until we finally reach the mighty Chagres River. At this point we will take off on the rafts for a full day of class II-III, big water, rafting fun. Once we have rafted the length of the Chagres we will be picked up by the indigenous Embera tribe in one of their hand carved canoes and transported to their river-side village. After viewing the native village we will continue down the Chagres on the canoes until we reach Lago Alejuela. Transport to Casa Nativa in Ancon will be provided later that day. Camping is available in either hammocks or tents, if needed we can provide a tent. Other than that, the only gear you need is a swimsuit and a backpack. All meals and snacks will be provided. This is the most popular weekend trip we offer! It is well worth the price. For a complete Panamanian jungle experience, it doesn’t get much better than this! Starting and ending in the Kalu Yala valley, we take care of all the logistics so you can enjoy the ride! Additionally, Weekend Warriors get priority seating on Bruce the Deuce! Whether it's a picnic lunch on the river, a group dinner prepared in the jungle by locals, or a cookout at Casa Nativa, three meals a day (plus snacks) are included! All dietary restrictions can be accommodated. No alcohol provided. Saturday night: camping-style lodging at a local farmhouse in the Chagres National Park, so bring your hammock or tents can be provided.